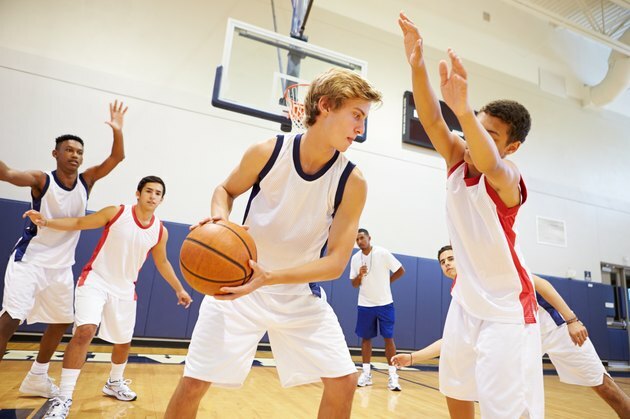 High school basketball rules are set by an organization known as the National Federation of State High School Associations. As the name suggests, the NFHS governs the rules for 16 different sports for girls and boys in all 50 states and Washington, D.C. About 18,500 member schools abide by the rules put in place by the NFHS, ensuring consistency for high school competition throughout the United States. Not only does the NFHS set rules for game play, it also determines the specifications for the basketball court and equipment used. The NFHS has deemed that a regulation-size high school basketball court be 84 feet long and 50 feet wide, with a center line dividing the floor into two equal sections. According to the NFHS, each of the two backboards should be located 4 feet from the endline and the rim must be 10 feet off the ground. An official high school game consists of four quarters with a halftime break following the first two quarters. For the varsity level, each quarter is 8 minutes; junior varsity games can have quarters of 6 or 7 minutes. As of 2013, there is no NFHS-mandated shot clock rule, although eight states have adopted a 35-second shot clock to increase the pace of the game; such state modifications are allowed by the NFHS. Under NFHS rules, a team has 10 seconds to advance the ball past the division line at center court, an offensive player cannot dribble or hold the ball for five seconds if a defender maintains legal guarding position throughout and offensive players cannot remain in the free throw lane for three seconds. Much like the game at every other level, baskets are worth one, two or three points. If a player is fouled on a shot attempt or when the opposing team has committed at least seven fouls in the same half, he is permitted to attempt free throws that are worth one point each. Any basket made during the course of game action inside the arc marked 19 feet, 9 inches from the rim is worth two points. A basket by a shooter with both feet behind the arc, known as the three-point line, is worth three points. . The NFHS has a number of rules regarding dribbling and advancing the ball. Carrying the basketball, double-dribbles and traveling all result in the offensive team losing possession of the ball to the defensive team. A player carries the basketball when she places her hand underneath the ball to gain more control while dribbling. Double-dribble violations are called any time a player touches the ball with two hands while dribbling or when he dribbles, picks the ball up and then dribbles again. A traveling violation occurs when a player with possession of the ball takes a step without first dribbling, takes more than 2 1/2 steps after ending a dribble on a drive to the basket, or jumps and returns to the floor without dribbling, passing or shooting the ball. Any kind of illegal physical contact between players is considered a personal foul in basketball. A foul can be called for hitting, pushing, slapping or holding an opponent. A personal foul results in free throws if the offensive player is shooting when fouled or after a team commits at least seven fouls in the same half, known as the bonus free throw situation. Flagrant and intentional fouls can be called on players for violent or premeditated illegal contact against an opponent; a flagrant foul results in the ejection of the offending player. Technical fouls can be assessed for unsportsmanlike conduct or rules infractions such as scorebook errors (a wrong jersey number).